The emperor at the beginning of the year was Maximinus Thrax, who had ruled since March 20, 235. Later sources claim he was a cruel tyrant, and in January of 238, a revolt erupted in North Africa. Some young aristocrats in Africa approached the regional governor, Gordian, and insisted to proclaim him emperor. Gordian agreed reluctantly, but as he was almost 80 years old, he decided to make his son joint emperor, with equal power. The senate recognized father and son as emperors Gordian I and Gordian II, respectively. Their reign lasted for only 20 days. Capelianus, the governor of the neighboring province of Numidia, held a grudge against the Gordians. He led an army to fight them and defeated them decisively at Carthage. Gordian II was killed in the battle, and on hearing this news, Gordian I hanged himself. Meanwhile, Maximinus, now declared a public enemy, had already begun to march on Rome with another army. The senate’s previous candidates, the Gordians, had failed to defeat him, and knowing that they stood to die if he succeeded, the senate needed a new emperor to defeat him. With no other candidates in view, on 22 April 238 they elected two elderly senators Pupienus and Balbinus (who had both been part of a special senatorial commission to deal with Maximinus) as joint emperors. This choice was not popular with the people however, and mobs threw stones at the new emperors. Therefore, Marcus Antonius Gordianus Pius, the thirteen-year-old grandson of Gordian I, was nominated as emperor Gordian III, holding power only nominally in order to appease the population of the capital, which was still loyal to the Gordian family. 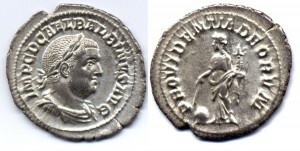 Pupienus was sent at the head of an army to face Maximinus, and Balbinus stayed in Rome. Meanwhile, Maximinus was also having problems. In early February, he reached the city of Aquileia, to find that it had declared for his three enemies. Maximinus besieged the city, but without success. By April, discontent due to this failure, the lack of success in the campaign in general, scarce supplies and the strong opposition of the senate, forced his legionaries to rethink their allegiance. 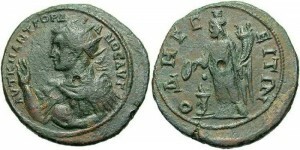 Soldiers of the II Parthica killed Maximinus in his tent, along with his son Maximus (who had been appointed deputy emperor in 236), and surrendered to Pupienus in the end of June. Maximinus and his son’s corpses were decapitated and their heads carried to Rome. For saving Rome from a public enemy, the soldiers were pardoned and sent back to their provinces. The co-emperor then returned to Rome, to find the city in riot. 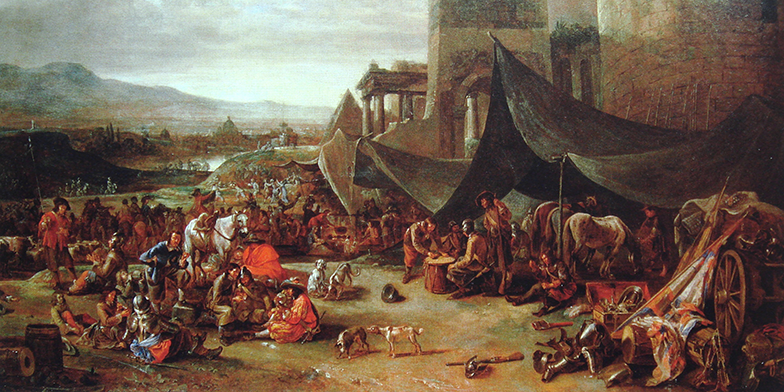 Balbinus had not managed to control the situation, and the city had burned in a fire, resulting in mutiny. With both emperors present, the situation calmed down, but the unease remained. 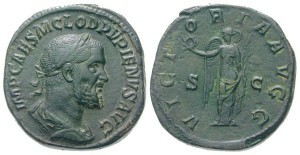 Coins from their reign show one of them on one side and two clasped hands on the other to show their joint power, yet their relationship was clouded with suspicion from the start, with both fearing assassination by the other. They were planning an enormous double campaign, Pupienus against the Parthians and Balbinus against the Carpians, but they quarreled frequently and could not agree or trust each other. It was during one of these heavy discussions, in May or on July 29, that the Praetorian Guard decided to intervene. They stormed into the room containing the emperors, seized them both, stripped them, dragged them naked through the streets, tortured and eventually murdered them. On the same day, Gordian III was proclaimed sole emperor (238-244), though in reality his advisors exercised most of his power. Together Pupienus and Balbinus had ruled for only 99 days. Gordians I and II were deified by the Senate.